If you don't measure food texture, you can't control it! If your bagels are too chewy, your chocolate too soft or your meat too tough, we can help. We will always work with you to find a solution that meets your goals and gets the best results for your product and application. Bakery, Fruit & vegetable, Meat, Confectionery, Dairy and other Food product's texture properties and requirements are dependent upon the product itself, as well as, subsequent use or consumption. The same food may be consumed raw or cooked, whilst different varieties and stages of maturity will result in different physical properties and ultimately expectations from the consumer or processor. The generic category of fruits and vegetables, for instance, contains a wide and varying range of tissue types from complex leafy structures to inhomogeneous berries and fleshy fruits to homogeneous tubers and root vegetables. The texture test and ultimately the test fixture used depends upon these considerations. 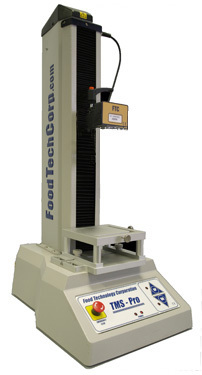 Compression is one of the most common tests done on food products. Typically a sample is placed on a flat surface and an upper compression platen is lowered into the sample. For a true compression test, the compressed sample is never smaller in diameter than the two compression platens. Test are performed by compression to a given force, a given position or a percentage of the original height of the sample. 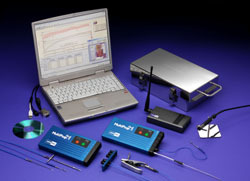 TPA or Texture Profile Analysis, is a specialized derivative of compression testing. TPA consists of a 4 step test of compression, relaxation, recompression and then a final relaxation. A set of mathematical equations are then used on the resulting data to arrive at numerical values of such texture attributes as hardness, cohesiveness, springiness and chewiness. Compression testing can also be useful in measuring the adhesive or stickiness of the product. It is common in stickiness measurements to compress to a preset degree, hold the position for a given amount of time, and then pull back up quickly to accentuate the adhesive result. Compression platens come in many different sizes and are made form various materials such as stainless steel, aluminium and plastics. Selection of the proper variant depends upon the product and the test sample's geometry. It is common since many foods are first sliced or “sheared” by the front incisors when introduced to the mouth. There are many different variations on the basic shear testing apparatus such as razor blades, V shaped blades, rounded blades and straight blades. We also offer a wire shear test cell for softer product like cheese and butter. Some versions such as the Warner-Bratzler meat shear design are somewhat standardized toward a particular type of food. What are the benefits of temperature profiling? Guarantee and prove food safety. Maximize product throughput and yield. Meet all HACCP requirements for monitoring, control and corrective action of cook/chill processes. Obtain consistent food quality, taste, texture and color. Quickly correct any hot or cold spots in your oven. Provide full process validation documentation to satisfy your customer requirements.